Nothing. There’s nothing not to love about this cheesecake. 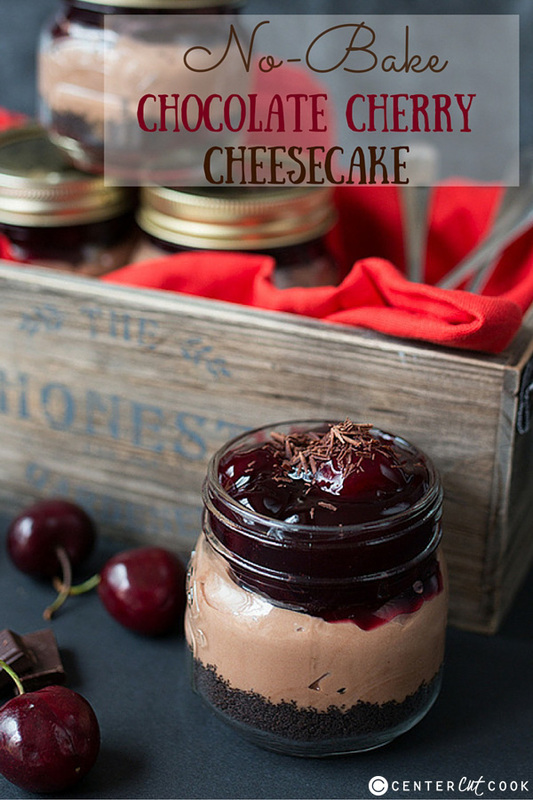 I’m slightly confusing myself with double negatives there, but I basically mean that you need to try this cheesecake. You can have it on the table in less than 20 minutes, or you can make it ahead of time and store it in the refrigerator. Plus the cute little mason jars make them extra portable! Take along to BBQs or just put one in your handbag for when you need that chocolate fix! The base is made from crushed chocolate Oreos (my absolute favourite cheesecake base). 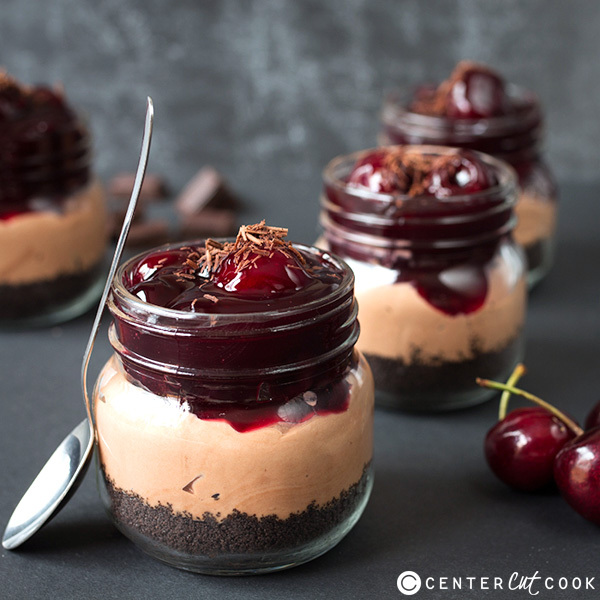 The chocolate cheesecake centre is made extra light and fluffy with the addition of whipped cream. And the topping? 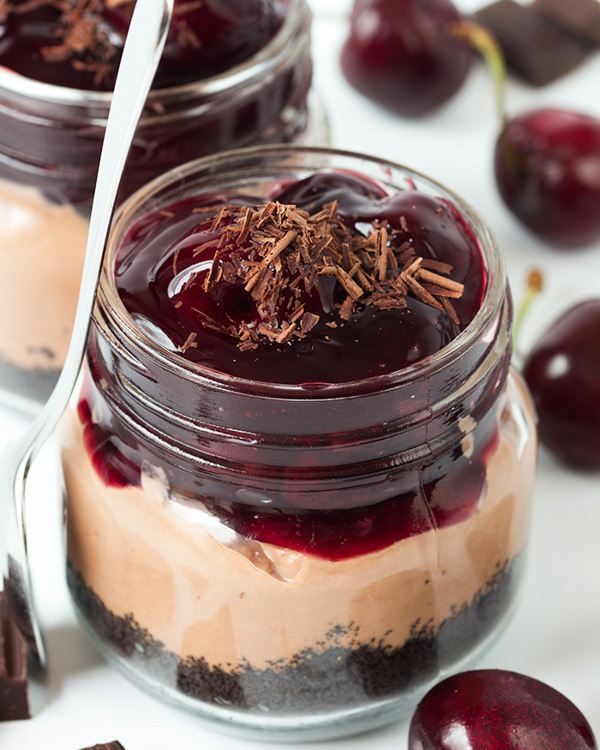 It’s as simple as cherry pie filling – with the addition of a few fresh cherries to give it more bite. Place the Oreos in a food processor pulse until you get coarse crumbs. Add in the melted butter and pulse again to combine. Distribute the crumbs between the four mason jars and pat down using a spoon or the end of a thin rolling pin. Place the cream cheese in a large bowl and whisk with an electric whisk for a few seconds until it loosens up. Add in the vanilla extract and confectioner’s sugar. Stir carefully with the whisk until the icing sugar is no longer in danger of puffing out all over you, then whisk until combined. Place the cream in another bowl and whisk until thick (until it’s soft and just holds its shape). Add the cream to the cream cheese mixture and stir to combine, then pour in the melted chocolate. Stir again to combine and distribute between the four mason jars. I find it’s easier to spoon the chocolate mixture into a plastic sandwich bag, then cut off the corner and pipe it into the mason jars. Tap the jars to remove any air bubbles. 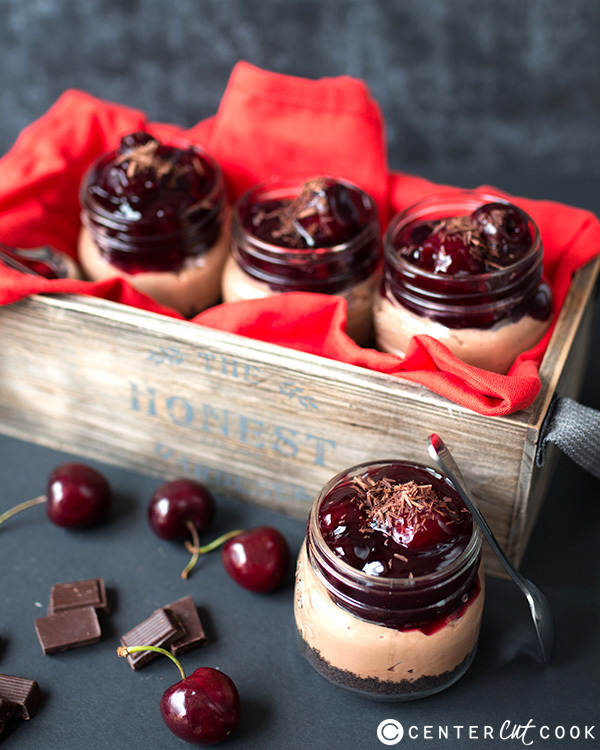 Place 3 fresh cherries on top of the chocolate mixture in each jar, then top with the cherry pie filling and a sprinkle of grated chocolate. Eat straightaway, or place lids on the mason jars and refrigerate for up to two days (can be eaten straight from the fridge).